Join us this Saturday, 30 April 2016, for our next easy-going ride when we will be looking at the public realm. Public realm is the space around and between buildings. We will visit various public spaces in Southwark and Lambeth, and the cycle routes between them, to consider questions such as: Does good design encourage walking and cycling? Do public spaces encourage us to meet our fellow citizens face to face? Do public realm improvements lead to gentrification? Jan Gehl (whose career has focused on improving the quality of urban life by re-orienting city design towards the pedestrian and cyclist) said: "First life, then spaces, then buildings – the other way around never works"; and “In a Society becoming steadily more privatized with private homes, cars, computers, offices and shopping centers, the public component of our lives is disappearing. It is more and more important to make the cities inviting, so we can meet our fellow citizens face to face and experience directly through our senses. Public life in good quality public spaces is an important part of a democratic life and a full life”. Come and find out whether Lambeth and Southwark have achieved this in some of the two boroughs’ public spaces. Ride Saturday 30 April 2016 starts at 2pm beside City Hall (Potters Field Park side), SE1 2AA finishing at around 4.30 in Clapham. The ride will be led by Clare Neely and Tessa Wright. All welcome, no need to book. If you have any questions before the ride contact Tessa on 07949 785258. Join us this Saturday, 30 April 2016, for our next easy-going ride. Rather than focusing on buildings, this month’s architecture ride will look at the public realm - the space around and between buildings. It will visit various public spaces in Southwark and Lambeth, and the cycle routes between them, to consider questions such as: Does good design encourage walking and cycling? Do public spaces encourage us to meet our fellow citizens face to face? Do public realm improvements lead to gentrification? There is a change in time and venue for our regular meeting this month. The meeting will now take place on Tuesday 19 April 2016 at Roots and Shoots, Walnut Tree Walk, Kennington, SE11 6DN (just off Kennington Road - near the Imperial War Museum) from 7:45 - 8:30pm. Lambeth Cyclists are working with Lambeth Council's Sustainable Transport Team to develop a 'Floral Ride' to the Lambeth Country Show in July. Cyclists from across London will be able to join the mass-participation ride from Waterloo to the Lambeth Country Show venue in Brockwell Park, SE24. It is hoped that the riders will then be able to parade around the Country Show site before a final display in the show ring. 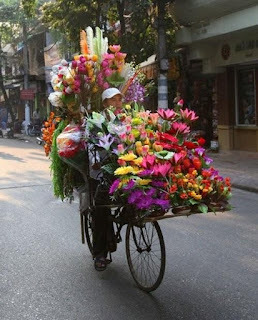 Cyclists will be encouraged to decorate their bikes with flowers and it hoped that local companies, gardeners, flower arrangers, makers, artists, cyclists, schools and many other will get involved in this spectacular event. 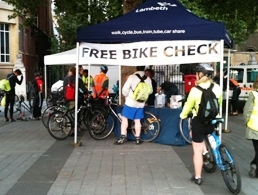 Lambeth's Sustainable Transport Team will be running their Dr Bike service this evening, Wednesday 13 April 2016, outside the James Clerk Maxwell building opposite the Imax Cinema, Waterloo Roundabout, Lambeth SE1 8XT. Come along 5 -7:30pm and get your bike ready for spring cycling now the warmer weather is here.. The Dr Bike team can fix basic problems, adjust your bike and offer advice on further action if required. This is also an opportunity to see the view from inside a lorry cab and talk to Lambeth staff about lorry blindspots to avoid any possible problems. The Police will also be attendance to advise on security and offer a security registration and marking service.